I caught the last half of Neil Cavuto today. He talked with Don Imus (now on Fox Business Network) about a number of things, including Sarah Palin. Naturally, my ears perked up at the mention of the Governor. Imus basically rehashed the same old line about how she's stupid, and she can't even read a book, let alone write one, bladdy, bladdy, blah. He also mentioned the Katie Couric interview. I first heard of Palin in April of '08 when Trig was born. I knew nothing about her, but I thought that the statement she put out about his birth was, well, beautiful. I concluded that here was a really cool person. Then I pretty much forgot about it. Fast forward to August 29th, and the rest is history. Once the media attack dogs started ripping her to shreds, my first impression of her and the picture the media was painting were turning out to be two completely different things. I honestly didn't know which one was the real Palin. I decided to find out for myself. For the next few weeks, I pretty much ignored the campaign and instead trolled around the Internet watching and listening to every interview and reading every article on the Governor that I could find. You know how with most politicians the deeper you dig the more you realize they're just scumbags? With Palin it was the opposite. The more I discovered, the more I liked her. A lot. And I realized that the media was either completely incompetent, or blatantly misrepresenting the facts. 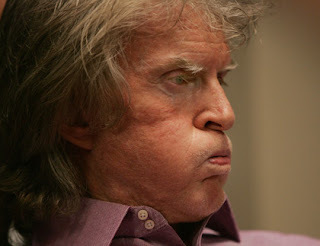 Now, back to Don Imus. Imus is one of the people who bought the media's line. He did not go and research for himself. You need look no further than his statement that Alaska has nine people and a polar bear. That's obviously hyperbole, but I have an all-new appreciation for Alaska as a result of my research of Sarah Palin. If he still buys the line that Alaska's an irrelevant ice cube, than he's obviously not done his homework. The same could be said for Dennis Miller. While Miller obviously likes Palin and doesn't believe all the media hype, he too has bought into some of the narrative. The bottom line: I don't know how to even be upset at people who are just ignorant. Imus is spouting off of the top of his head with no information other than Katie Couric to back him up. He is just plain uninformed. So while I can't say I liked his comments, I blame the media narrative more than him. 1. If Imus wants to complain about a stupid vice President, he need look no further than our current one. He says more moronic things than Palin ever has every single day, and yet the media doesn't care. During the election the media was even more disingenuous. They made it sound like John McCain was going to drop dead after his inauguration speech,and then this crazy, crazy woman would kill us all! They focused on Palin possibly becoming President like a laser beam. 2. Imus commented that Palin couldn't even read a book. Where does he get that idea? Oh, yeah, Couric's question about what newspapers Palin reads. Let's look at Sarah's answer: "Oh, any of 'em. All of 'em." Only in the twisted world of crony journalism does "Any" and "All" translate to "NONE! SHE READS NOTHING! SHE DOESN'T EVEN KNOW THE ALPHABET!" Journalism is dead. Some people just haven't buried it yet. Who Does He Remind Me Of? Palin on Obama's Enemies List?